Indian vegetarian restaurant on George Street, part of a worldwide chain with several other branches in London. It opened in March 2017. They also do takeaway, but they don't take orders over the phone; you have to place your order in person at the restaurant. Accessibility: No steps to get in. Toilets are in the basement, down a flight of stairs with a hard-to-grasp handrail on both sides. It was previously a branch of the Italian restaurant chain Bella Italia photo, but this closed down some time between May and September 2016. As of September 2016 it was vacant and stripped out photo taken through window. 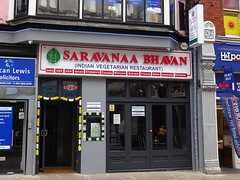 As of October 2016 there was a sign up indicating that it would be opening soon as a branch of Indian vegetarian restaurant Saravanaa Bhavan photo. As of early March 2017 this still hadn't happened, but progress had been made in that there was a proper sign up above the shopfront photo. It finally opened on Saturday 12 March 2017. Last edited 2019-01-05 12:19:58 (version 44; diff). List all versions. Page last edited 2019-01-05 12:19:58 (version 44).